I love s’mores, but sitting in front of a camp fire in the middle of the day while it’s 95 degrees outside isn’t all that appealing when I develop a craving for one. So, here’s the compromise. 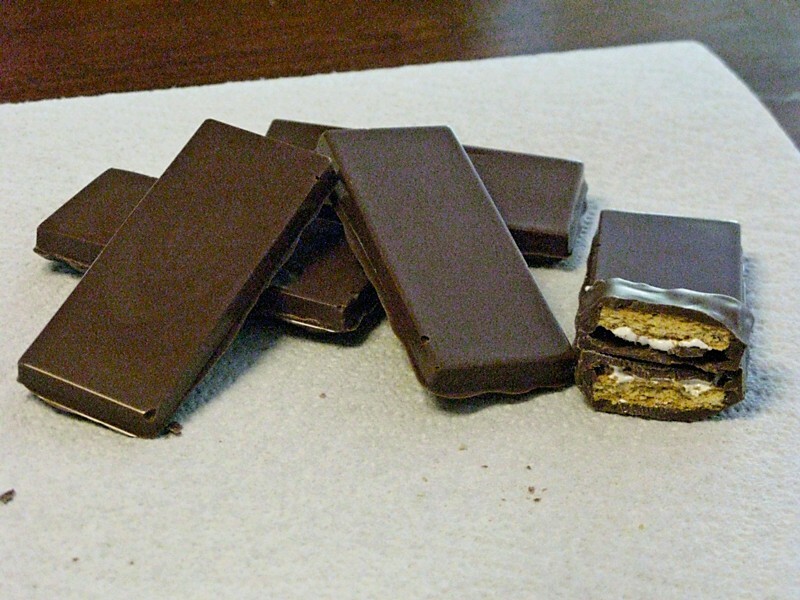 Grab some honey graham crackers from the store, along with some marshmallow creme to be inside the chocolate bar. 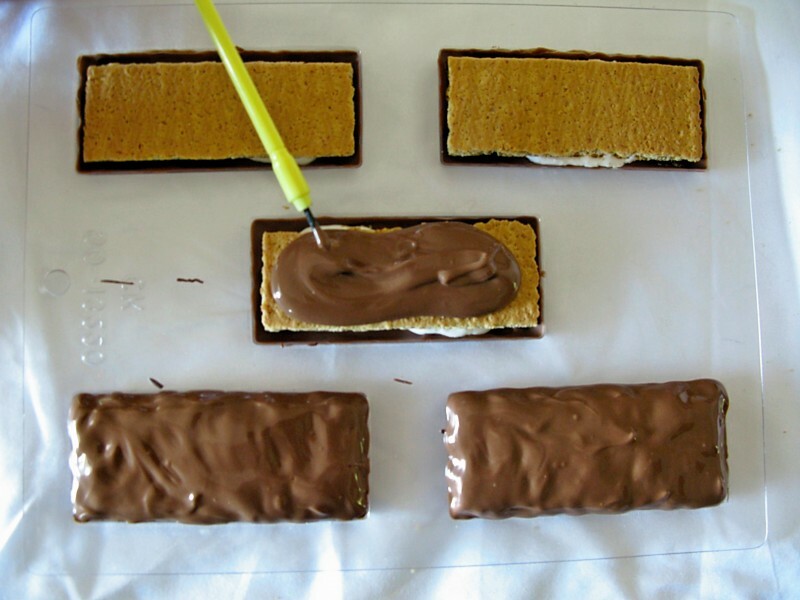 Put a dab of chocolate in the mold, and use a paint brush to evenly distribute along the bottom and up the sides. Set in the freezer for a couple of minutes to set. I had to cut the graham crackers to fit the mold I have, which is a little bit longer than a standard rectangle of the graham crackers…but that means more of a bar! Put some of the marshmallow creme in the bottom, and try to spread somewhat evenly along the mold. Otherwise, if you just put one big blob, it’ll ooze out the sides instead of going all the way across, and this helps it be more evenly distributed throughout the bar. 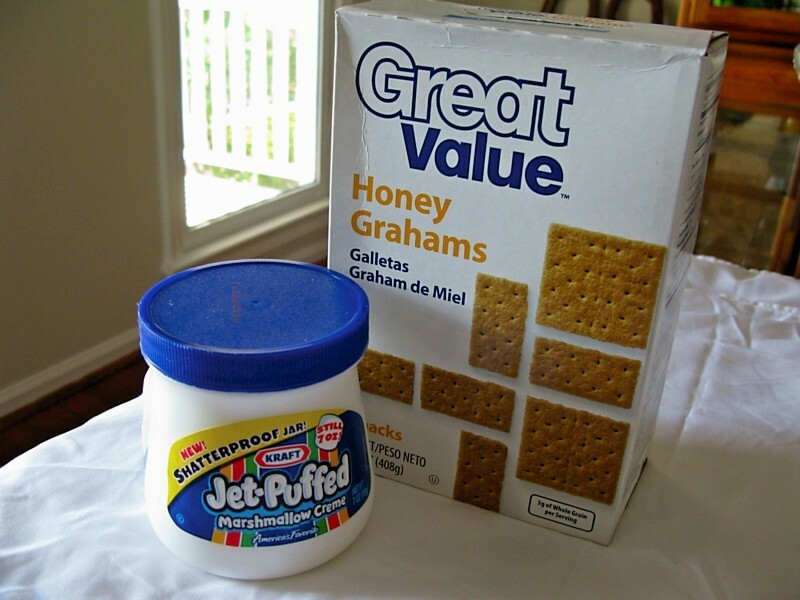 Place the graham cracker on top of the creme. Next, cover the top with the melted chocolate. Try to look over and make sure there aren’t any big gaps with the chocolate doesn’t cover, this keeps the bar fresh inside. Put back in the freezer to set, and they’re done. These babies are very delicious, and depending on what mold you want to use, you can decide how big or small you want the bars to be. I’ll enjoy these out by the pool if I want…but will have to gobble them up fast so the chocolate won’t melt. Good enough excuse for me! Here is another close-up picture taken with a different mold that I used. This is the actual candy bar chocolate mold, which personally I think works a LOT better for this particular candy bar. It’s deeper, so you can fit more of the marshmallow creme inside, and it also looks better. I bought this candy bar mold at Hobby Lobby, and I’m not positive but it may be sold at other arts and crafts stores in the chocolate and candy mold section. 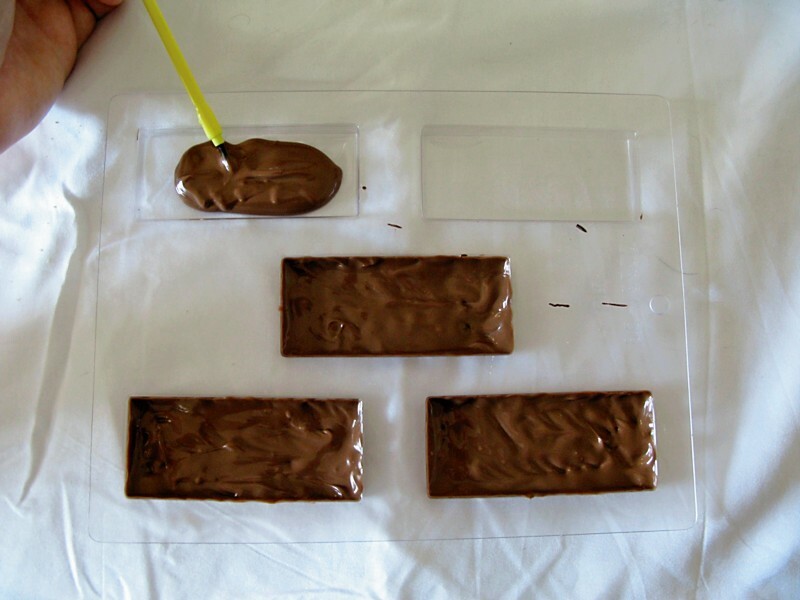 Click HERE for a chocolate mold similar to this that is good for these bars. 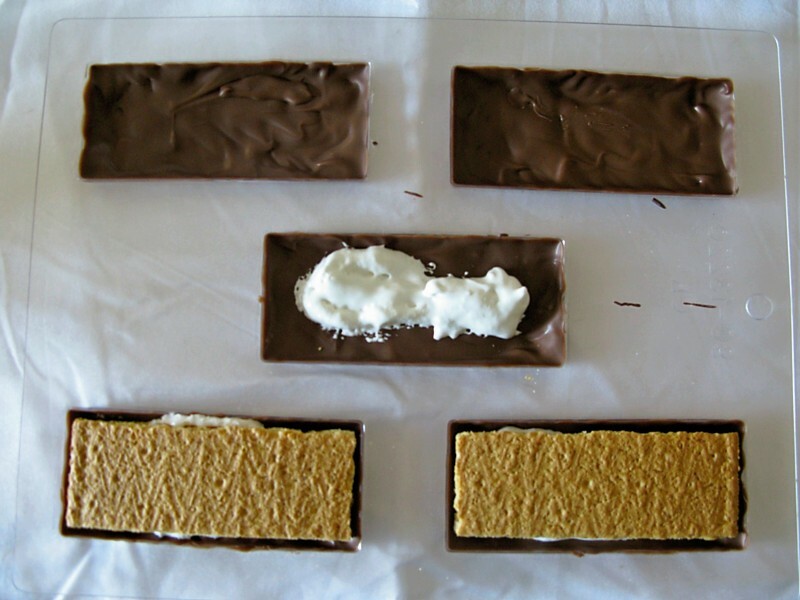 You can cut the size of the graham crackers to fit any size bar you’d like to make! I just posted a link in the entry of a good mold to use. 🙂 You can also check arts and crafts stores for chocolate molds, like AC Moore, Michaels, and Hobby Lobby.